Tiffany Lynn Pulcino, M.D., M.P.H. Tiffany Pulcino, MD, MPH, board-certified in internal medicine and pediatrics, joined the practice in 2008. She is a graduate of Mount Sinai School of Medicine and completed her residency at the University of Rochester Medical Center in the Internal Medicine and Pediatrics Program. 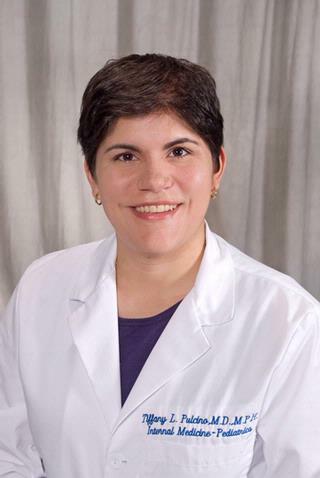 Dr. Pulcino has a special interest in transitional care: the process of young adults moving into the adult health care system, especially those with medical problems diagnosed in childhood, such as cystic fibrosis, sickle cell anemia, inflammatory bowel disease, and congenital heart disease. Fortuna RJ, Halterman JS, Pulcino T, Robbins BW. "Delayed transition of care: a national study of visits to pediatricians by young adults." Academic pediatrics.. 2012 12(5):405-11. Epub 2012 Jun 17. Pulcino T, Galea S, Ahern J, Resnick H, Foley M, Vlahov D. "Posttraumatic stress in women after the September 11 terrorist attacks in New York City." Journal of women's health.. 2003 Oct 0; 12(8):809-20.